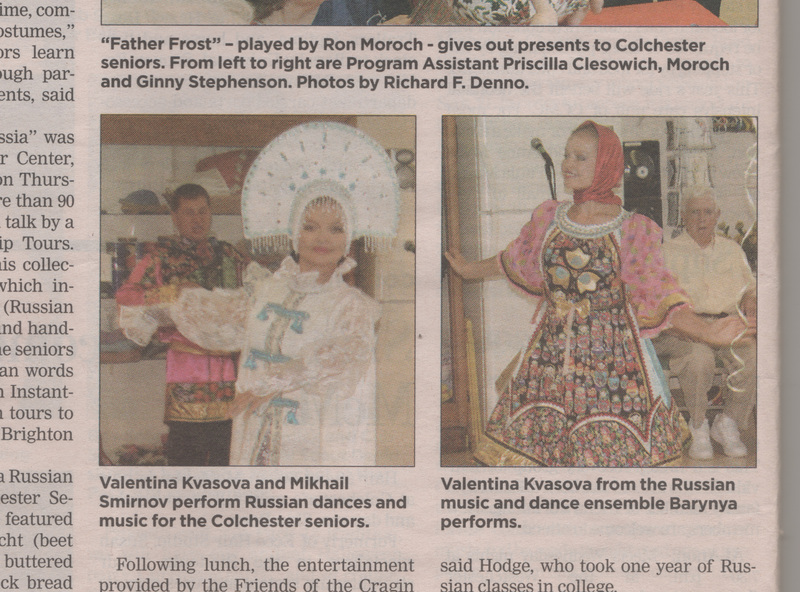 Russian dance, music and song Duo performed one hour concert at the Colchester Cenior Center, 8 Linwood Avenue (Route 16), Colchester, Connecticut 06415. 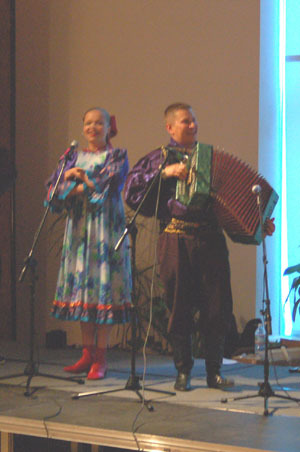 Mikhail Smirnov (guitar, garmoshka, vocals, balalaika) and Valentina Kvasova (dance, vocals) performed a program of Russian, Cossack, Ukrainian, Jewish, Siberian and Gypsy traditional dances and songs. 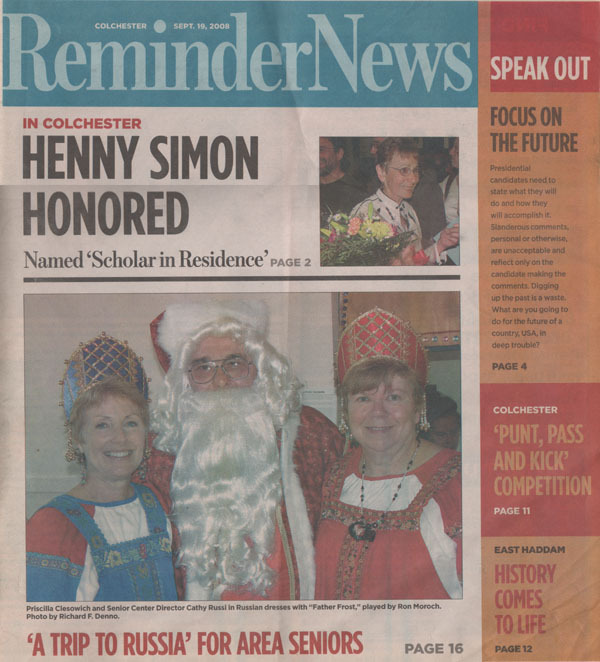 Russian duo is available for hire for the performing art centers, festivals, schools, libraries, concert halls, restaurants, private and corporate events. For price quote email mikhail@barynya.com or call (201) 981-2497. 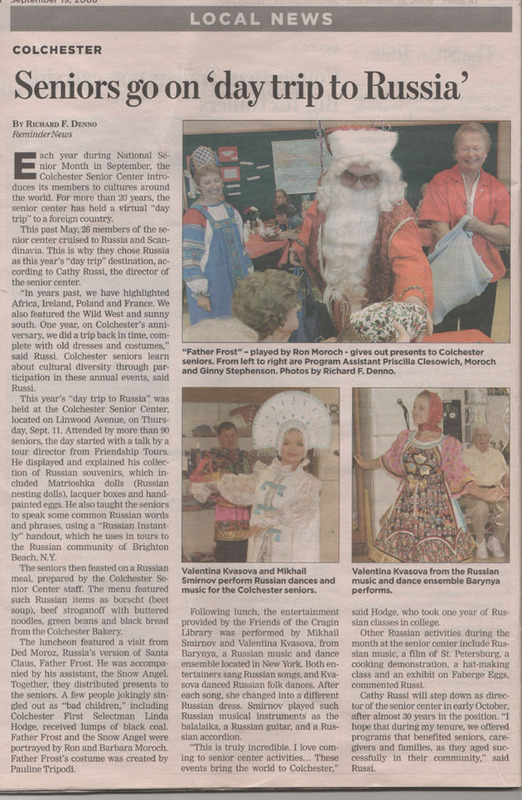 Russian Dance & Music Duo offers program of Russian, Cossack, Ukrainian, Siberian, Russian Jewish, and Russian Gypsy folk songs, traditional dances including "Kalinka", "Moscow Nights", "Katyusha", "Dorogoi Dlinnoyu", "Gori-gori", "Korobushka", "Dark Eyes", "Polyushko", "Pidmanula", "Kazachok", "Varen'ka", "Maty", "Two Guitars", Kazatchok", "Metelitsa", "Barynya". Total lenght of the program is about two hours.Russian Duo has extended repertoire, family oriented program, explanation of the musical and dance numbers in English or Russian.The Russian Duo has over 15 years experience of professional performances for audinces of all ages in the United States of America, always on-time, easy communication via phone or email, each dance number performed in defferent costume that matches the region of Russia where the song or dance was originated.Each dance performed in a new set of costumes: Moscow region, North Sea, Cossack, Ukrainian, Russian Gypsy, Volga River, Siberian, and Boyarsky. Valentina Kvasova was born in the city of Rostov-na-Donu, Cossack's Capital of Russia, on August 25, 1976. After finishing of the formal education in Voronezh Choreographic School in 1994 she has been invited to The Don Cossacks State Academic Song and Dance Ensemble as the actress of ballet. Professional skills and great talent let Valentina join the concert program in a short period of time and soon to become soloist of the ensemble. 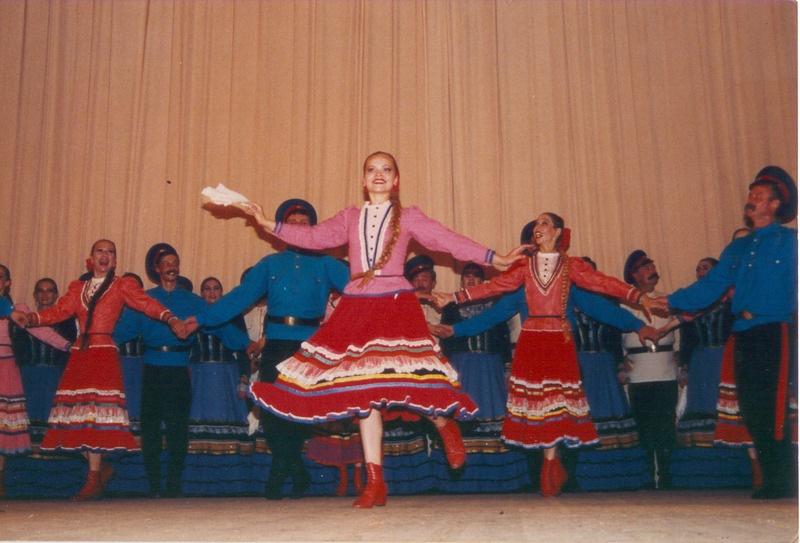 Valentina successfully performed with The Don Cossacks in Russia, Japan, Spain, Hungary, the republic of South Africa, the USA and other countries. 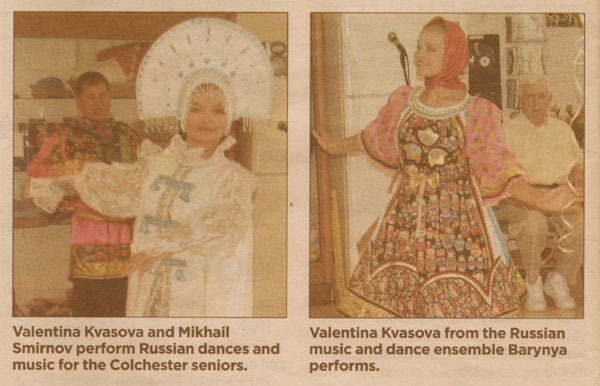 As a professional Russian folk dancer Valentina Kvasova equally manages roles of lyrical, playful or comic characters. The dynamical, bright, sociable, talented person, Valentina is having recognition among professionals.Valentina is also performing as a freelance dancer with other companies and solo. 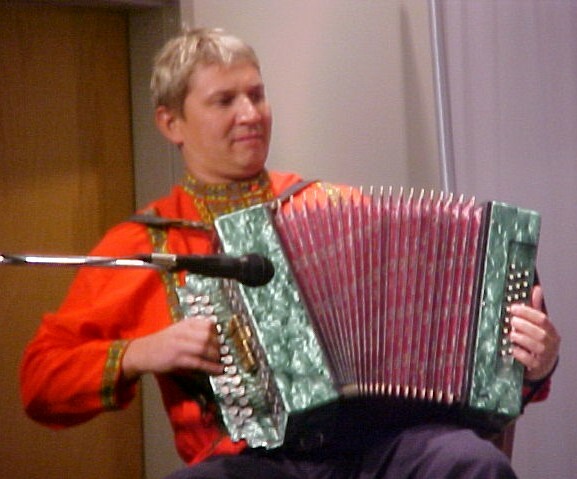 Mikhail Smirnov is a professional Russian folk singer, performer and musician with many years of experience. He plays garmoshka, balalaika, guitar, jaleika, kugikly, balalaika contrabass, balalaika bass and gusli. 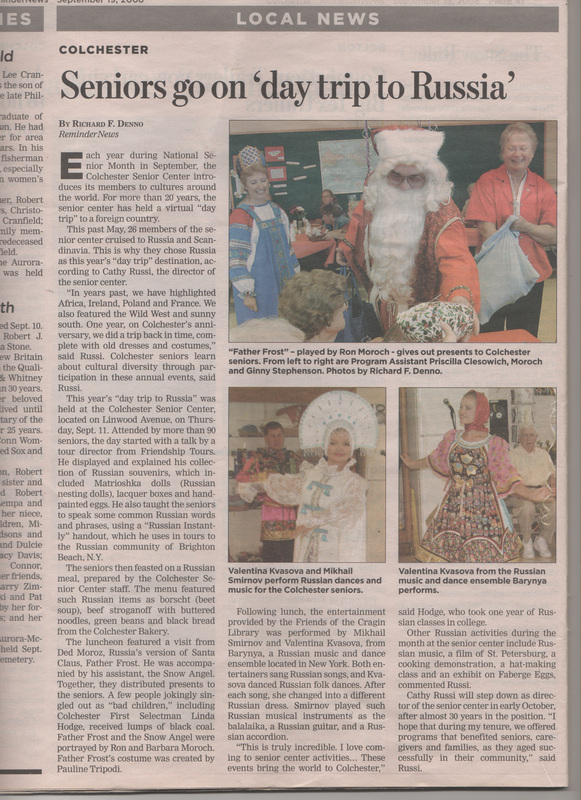 His specialty is traditional Russian folk music and songs from various regions of Russia. As a student of Moscow State University of Culture and Arts Mikhail went to many different parts of Russia such as Tver, Smolensk and Belgorod to collect Russian folklore. 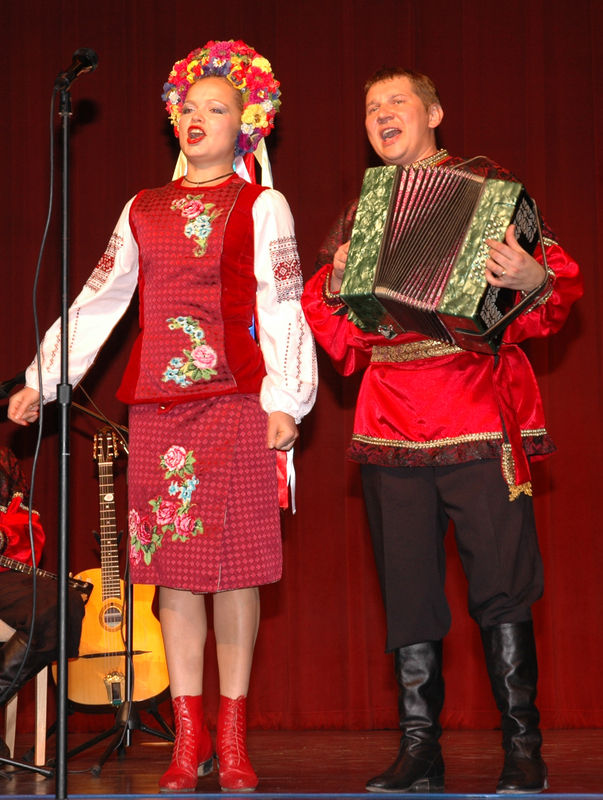 In folklore expeditions Mr. Smirnov have recorded over 100 hours of Russian folk songs, tunes, and lyrics. Mikhail Smirnov is also well know in Russian community as a director of Barynya, the biggest Russian dance troupe outside of Russia, DJ, MC, tamada, and bilingual Russian-English speaking wedding minister. Russian dance, song, and music ensemble Barynya led by Russian folk accordion garmoshka player and singer Mikhail Smirnov with Russian Gypsy singer Vasiliy Romani and Ukrainian Cossack dancer Serhiy Tsyganok provided two 45 min performances of Russian, Cossack, Ukrainian, Russian Gypsy and Jewish songs, music, and dances on Tuesday, March 6th, 2018, 8:45 and 9:45am at the Tokeneke School, 7 Old Farm Rd, Darien, CT 06820. 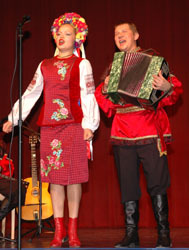 Program of performance included Russian folk song with garmoshka "Subboteya" (Russian: Субботея), Russian folk dance Barynya, Russian song Katyusha, Cossack dance, solo on Russian seven string guitar by Vasily "Vengerka" (Венгерка), Jewish Bottle dance, dance of Russian Bear (Танец медведя), Russian song "My darling" (Живёт моя отрада в высоком терему), Ukrainian folk song and dance Pidmanoola, Russian Tongue-Twisters Medley (Скороговорки), Russian Alphabet Lesson, Russian folk song "Korobushka" with the percussian orchestra consisted of students, Russian folk dance lesson, Russian folk dance Kalinka. 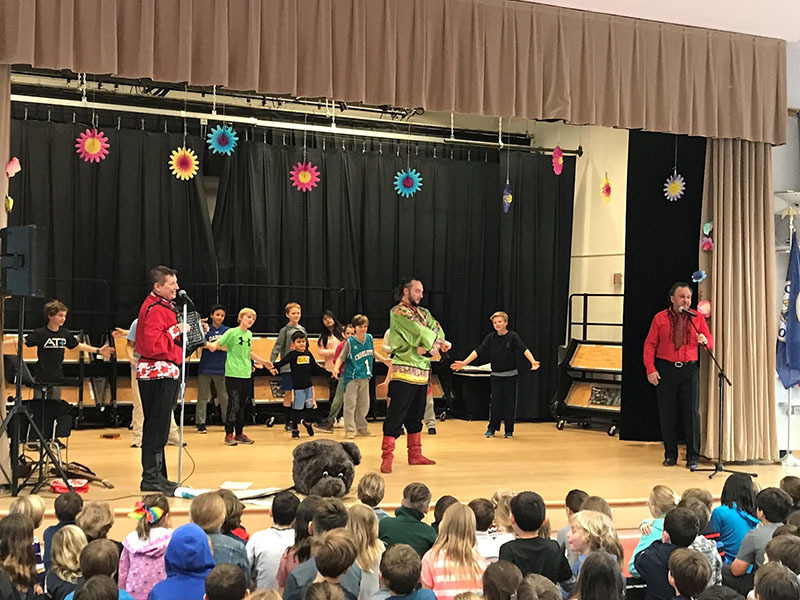 Russian traditional dance, song, and music trio provided 45 min performance of Russian, Cossack, Ukrainian, Russian Gypsy and Jewish dances, songs, and music on Tuesday, February 27, 2018 at the Haynes Elementary School in Connecticut. 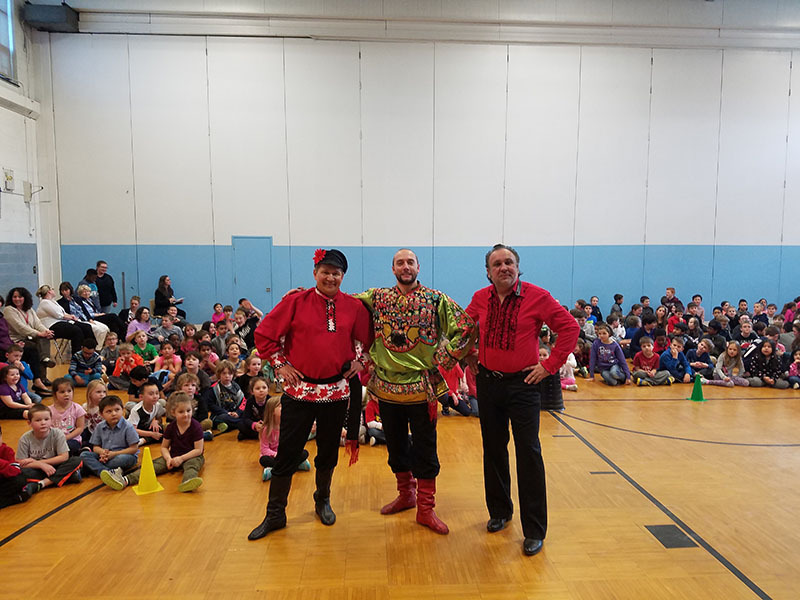 Cast od performers: Mikhail Smirnov, Vasiliy Romani, and Ukrainian Cossack dancer Serhiy Tsyganok. 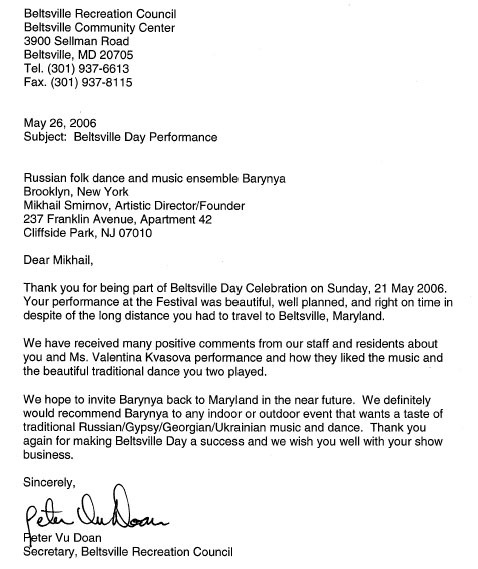 Chino Valley, Arizona, Oracle, AZ, Balalaika Los Angeles, Russian music trio in California, Barynya in Toronto, Canada, Barynya in Erie, PA, Barynya in Florida, Barynya at Naval Research Laboratory, Washington D.C, June 2010, Barynya concert in Washington D.C., March 2012, Barynya in Hong Kong, China. Photos, video, Russian dancers Birmingham UK, Russian dancers in Lexington, Massachusetts, Panera Bread corporate event, Boston, MA, Russian dance/music, Boston, Massachusetts, Russian music balalaika trio in Boston Massachusetts, Barynya in Russian Consulate NYC, Howell, NJ, Russian dance/music in San Antonio, Texas 2010, Russian dancers in Texas, 2011, Mexico tour 2009 - 5th Chihuahua International Festival, Barynya musicians in Minneapolis, Minnesota, Alameda, CA, Lincoln, CA, Oxnard, CA, Santa Ana, CA, Sun Valley, CA, Tracy, CA, Walnut Creek, CA, Barynya at BDAA convention-2005 photos, Barynya at BDAA convention-2005 video, Barynya at BDAA convention-2006 photos, Russian dance directory, l’ensemble de musique et danse russe "Barynya", St.Petersburg, Florida, Sarasota, FL, Barynya in Tennessee, Russian dancers in Los Angeles, CA, Barynya Balalaika in Los Angeles, California, Colchester, CT, Darien, CT, Enfield, CT, Greenwich, CT, Middletown, CT, Plainfield, CT, Stamford, CT, Stratford, CT, Taftville, CT, Wolcott, CT, Chicago, Illinois, Morehead, KY, Bastrop, LA, Tallulah, LA, Bel Air, MD, Finksburg, MD, Laurel, MD, Ridge, MD, Joplin, MO, Albany, NY, Amitvylle, NY, Avon, NY, Buffalo, NY, Geneseo, NY, Holbrook, NY, NYC dinner Cruise, NYC Encounter Festival, Plattsburg, NY, Staten Island, NY, Watertown, NY, Yonkers, NY, Far Hills, NJ, Monroe, NJ, Ridgewood, New Jersey, NJ, Toms River, NJ, Salem, MA, Townsend, MA, Gardner, MA, Aston, PA, Doylestown, PA, Du Bois, PA, Dunmore, PA, Erie, PA, Gettysburg, PA, Houtzdale, PA, Lake Como, PA, Millerstown, PA, St. Marys, PA, Memphis, TN, Amarillo, TX, Ira, TX, San Antonio, TX, Big Island, VA, Earlysville, VA, Harrisonburg, VA, Lynchburg, VA, Radford, VA, Everett, WA, Olympia, WA, Morgantown, WV.